NOS Radio and Television is a professional journalistic organisation. Around 360 journalists are involved in making the daily news and sports programmes. NOS reports on important national and international events. NOS makes a major contribution to Dutch public broadcasting with 2,000 hours of television and 4,000 hours of radio a year. The NOS programme 'Radio 1 Journaal' broadcasts around 1500 hours per year. The listener is brought up to date about the most recent news developments in quickfire tempo. Radio 1 Journaal broadcasts seven days a week, three times a day. More than 80 journalists have signed up for a job at 'Radio 1 Journaal'. 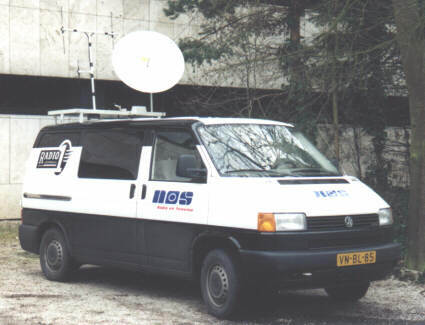 The NOS 'Radio 1 Journaal' uses a dedicated broadcast van designed by AUDIO "F". Because of the large number of persons working with the van operation was required to be straightforward. AUDIO "F" used an unique switching matrix which alters the connections between the equipment with a single button. The NOS van, mind the H.F. antennas and the satellite dish. A second requirement was to be able to start broadcasting in ANY situation, to meet this requirement the van was equipped with satellite communication equipment and a complete 230 V backup power system. Whenever an event occurs, the NOS is ready and on air within five minutes. 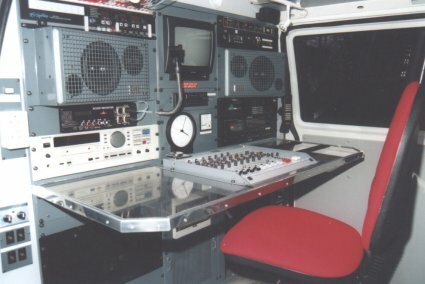 Take a look at the interior of the NOS Radio one broadcast van. The picture also shows the F2 monitor loudspeakers mounted in a 19" rack. NOS 'Radio 1 Journaal' can be heard within the Netherlands on several FM-frequencies and on AM 747. The AM emitter reaches several hundred miles into Europe. Mirasound is a Dutch company active in the CD mastering and production market. Currently over 2000 titles are produced. 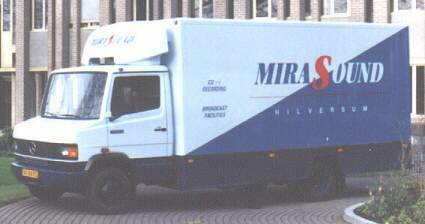 Mirasound required a versatile mobile recording studio. In this van the 19" versions of the F1 Reference Monitor Loudspeakers are applied.